This Mediterranean Lentil Salad has all the best bits of a Greek salad. Instead of lettuce, I throw in quick-cooking lentils for a little extra protein to get me through the afternoon. It holds its crunch and travels like a champ to work or a party. It’s healthy, colorful, and every bite is bursting with flavor. Whenever I’m a little bored of lunch, I remember this fantastic salad and pow! My mood does a complete one-eighty. It’s got Bright, sunshiny color in every delicious forkful. 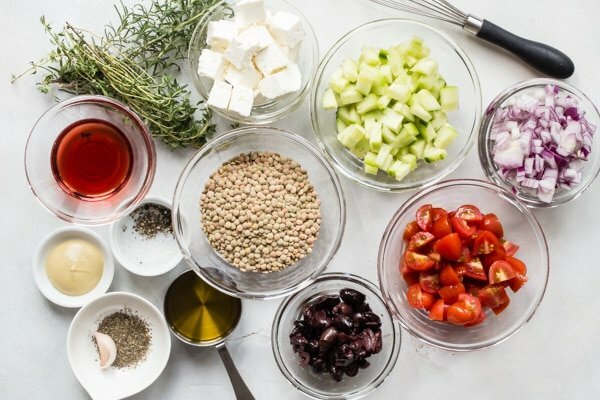 These are the reasons I love Greek salad: purple Kalamata olives, red onion, cherry tomatoes, fresh herbs, crisp cucumbers, and salty feta cheese, not to mention a classic red wine vinaigrette. This salad is all that, minus the lettuce. Best of all, you can (and should) make this salad year-round. 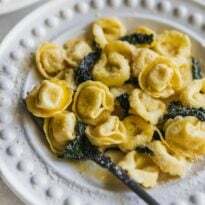 The ingredients are easy to find no matter what the season, and besides, we could all use a little Mediterranean sunshine, especially in the dead of winter. 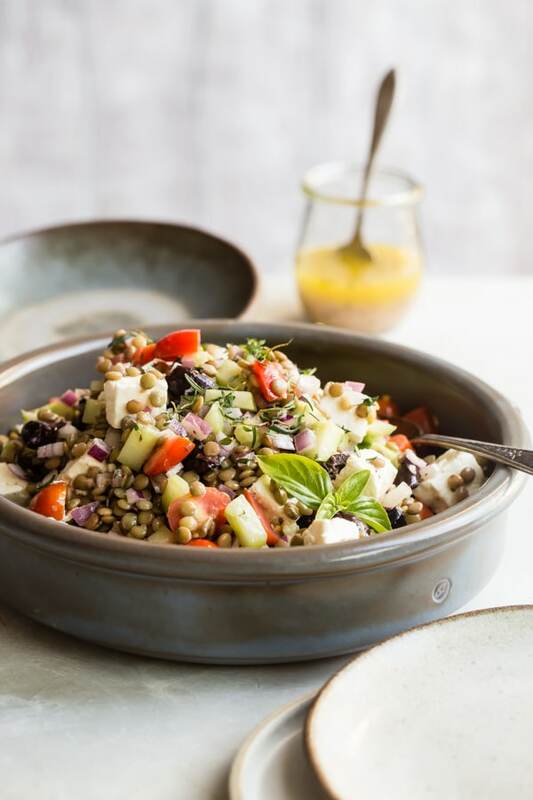 Need an extra large amount of this Mediterranean Lentil Salad with feta? Click and slide the number next to “servings” on the recipe card below to adjust the ingredients to match how many you’re feeding—the recipe does the math for you, it’s that easy. What kind of lentils work best for making cold lentil salad? For this recipe, I select brown or green whole lentils. The brown lentils should be the easiest to find, but really you can use any whole lentil you like. Stay away from split lentils for this recipe, however; they’ll break down too much to make a good salad. Lentils do not contain gluten; in fact, lentil flour is a common gluten-free flour substitute. 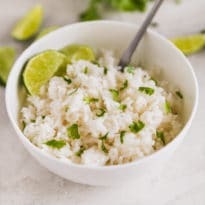 Anyone who needs or wishes to eat a fully gluten-free diet can be confident that lentils – red, green and brown varieties alike – are fine to eat. However, the lentils you find could be processed in a facility where wheat or soy are also processed, so I would always check the packaging for a “gluten-free” label, just to be on the safe side. 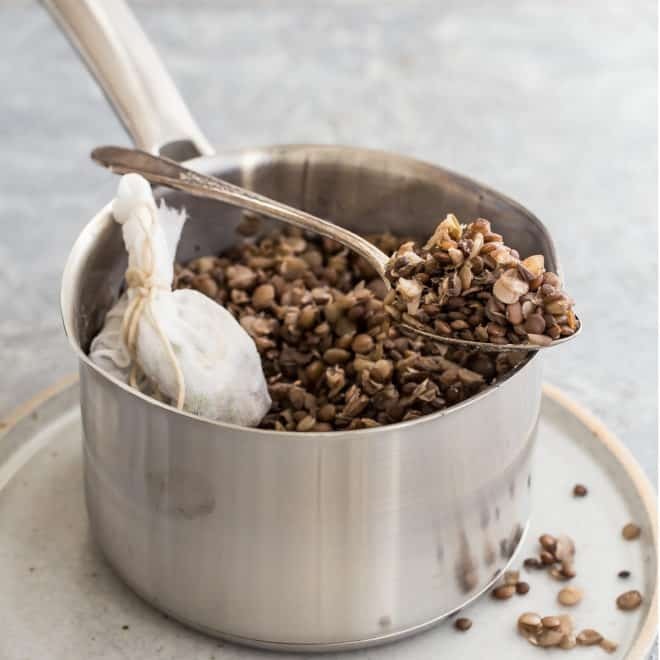 If you’re curious, I write about lentil nutrition and other fabulous qualities a little more in-depth in this how-to. 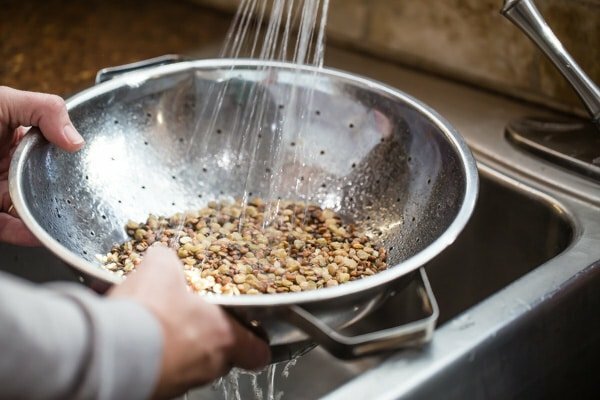 First, rinse your lentils with fresh cold water before cooking to remove any dust or debris. Give them a good going-over, in case there’s a pebble in with them. You don’t need to soak them like beans. To cook on a stovetop, using 3 cups of liquid (water, stock, etc) to 1 cup of dry lentils. Be sure to use a large enough saucepan as the lentils will double or triple in size. Now’s the time to add any aromatics you want: garlic, onion, bayleaf, etc. Bring to a boil, cover tightly, reduce heat and simmer until they are tender. That’s all there is to it! Be sure to season with salt after cooking – lentils get tough if salted before they’re done. Above all, I love cooking lentils because of their speedy cooking time–it’s so much faster than other legumes like beans, chickpeas, or split peas. For whole lentils, cook time is typically 15-20 minutes. Green lentils or lentils de Puy may require a bit more time, however. Can you make vegan Mediterranean Lentil Salad? 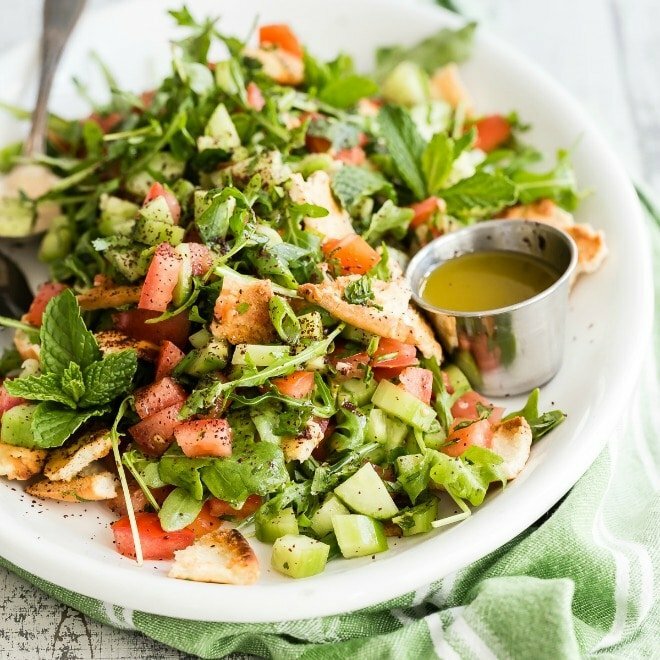 You absolutely can make this protein-packed salad vegan-friendly. Substitute out the feta with your favorite crumbly vegan cheese. That’s all there is to it! 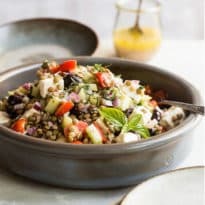 This healthy lentil salad is a huge hit, is incredibly versatile, and has a lot of staying power. 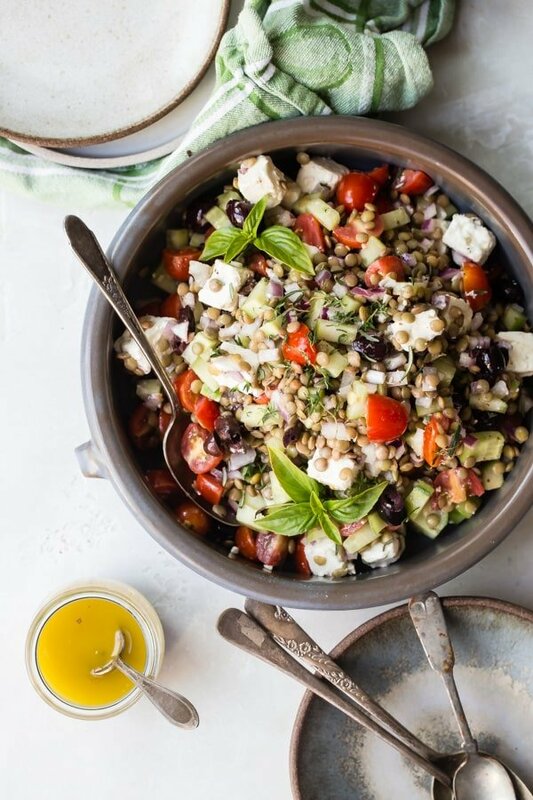 I’ll make a double or triple batch of Greek lentil salad and serve it on a platter of chopped fresh greens to make it stretch just a little bit longer on the table. Sometimes I’ll add diced red, yellow, or green bell pepper to the salad, too. Anything that’s bold, bright, and has some crunch. I love using fresh basil and mint scattered over the top, but it’s not absolutely necessary. 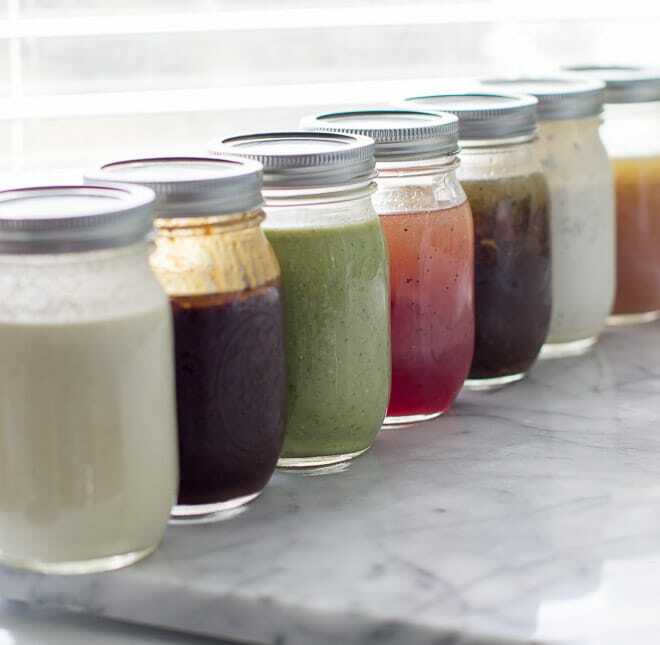 The oregano in the dressing carries it through. To spice things up, toss in a few pepperoncini peppers, thinly sliced. This Mediterranean Lentil Salad has all the best bits of a Greek salad. Instead of lettuce, I throw in quick-cooking lentils for a little extra protein to get me through the afternoon. It holds its crunch and travels like a champ to work or a party. It's healthy, colorful, and every bite is bursting with flavor. Bring 3 cups water to boil. Add lentils and simmer until tender, about 20 minutes. Drain well. Spread on a rimmed baking sheet to cool completely. 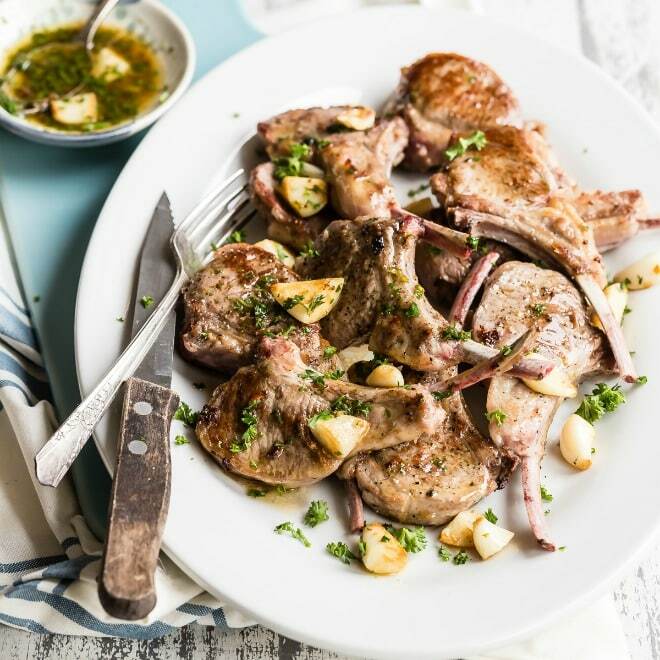 In a small bowl, whisk together olive oil, red wine vinegar, mustard, garlic, and oregano. Season to taste with salt and pepper. 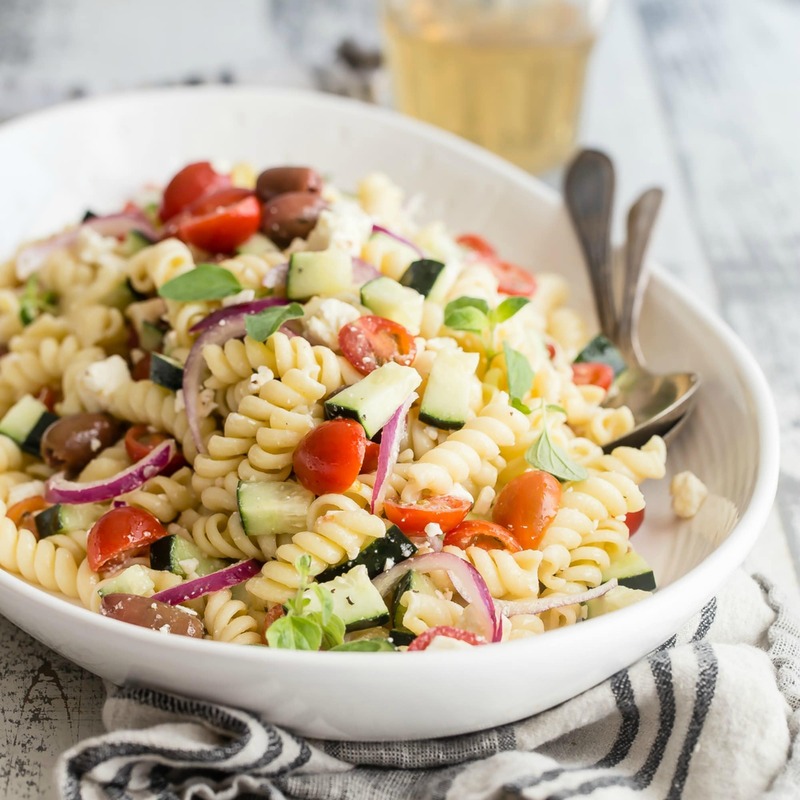 In a large bowl, combine cooled lentils, cucumbers, tomatoes, olives, red onion, and feta cheese. Drizzle with vinaigrette. Toss to combine and garnish with fresh herbs if desired. Season to taste with salt and pepper. 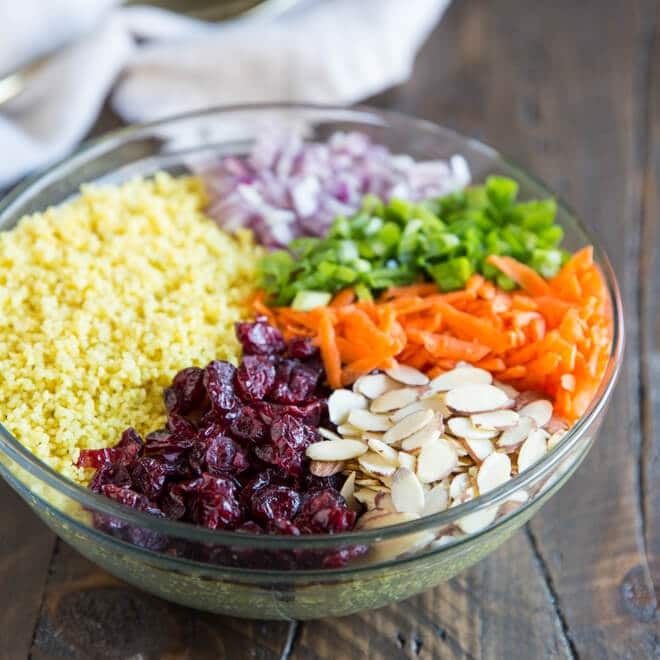 To make this salad dairy-free or vegan, omit the cheese or switch it out with your favorite non-dairy crumbly cheese.